Anna, Timothy E. (1978). The Fall of Royal Government in Mexico City. Lincoln: University of Nebraska Press. ISBN 0-8032-0957-6. Christon I. Archer, ed. (2003). The Birth of Modern Mexico. Willmington, Delaware: SR Books. ISBN 0-8420-5126-0. Hamill, Hugh M. (1966). The Hidalgo Revolt: Prelude to Mexican Independence. Gainesville: University of Florida Press. Hamnett, Brian R. (1986). 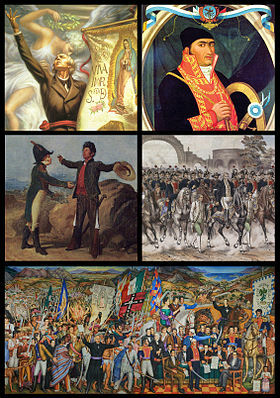 Roots of Insurgency: Mexican Regions, 1750–1824. Cambridge University Press. ISBN 978-0521-3214-88. Knight, Alan (2002). Mexico: The Colonial Era. Cambridge University Press. Timmons, Wilbert H. (1963). Morelos: Priest, Soldier, Statesman of Mexico. El Paso: Texas Western College Press. Jaime E. Rodríguez O, ed. (1989). The Independence of Mexico and the Creation of the New Nation. UCLA Latin American Studies. Los Angeles: UCLA Latin American Center Publications. ISBN 978-0-87903-070-4. หน้านี้แก้ไขล่าสุดเมื่อวันที่ 27 ตุลาคม 2560 เวลา 16:38 น.